The Republic of Sierra Leone celebrates its Independence Day on April 27. On this day in 1961, Sierra Leone declared its independence from the United Kingdom. The territory of present-day Sierra Leone became inhabited by indigenous African tribes at least 2.5 millennia ago. The first Europeans to set foot in what is now Sierra Leone were the Portuguese in the late 15th century. For a while they maintained a fort near the Freedom estuary (an important source of drinking water). Some Portuguese sailors chose to stay in Africa permanently to trade with the local people and even married local women. From the late 15th to the mid-19th centuries, Sierra Leone, along with the rest of West Africa, was one of the centers of the Atlantic slave trade. Portuguese, Dutch, French and British merchants all engaged in slave trade in the region, annually exporting tens of thousands of slaves from West Africa. In the 17th century, Portugal began to lose some of its colonies, and the British became the most significant European group in Sierra Leone, establishing a number of trading ports. The colonization of Sierra Leone began in 1787, when the British founded Granville Town (now known as Cline Town), the first settlement of the so-called Province of Freedom. Five years later, settlers from Nova Scotia established Freetown, that would go on to become the capital of Sierra Leone. The British Crown Colony of Sierra Leone and its Dependencies was formally established in 1808, with Freetown serving as its capital. Commonly referred to as British West Africa, it comprised the territories of present-day Sierra Leone, The Gambia, Ghana (then known as Gold Coast) and most of Nigeria. In 1896, the hinterland of Sierra Leone became a British protectorate. The two entities, the Colony and the Protectorate, each had a separate and different political system. After World War II, there were proposals to provide a single political system, which caused antagonism between the colony and protectorate. Nevertheless, in 1950, their legislatures were united by a new constitution, providing a framework for decolonization. In 1953, Sierra Leone was granted local ministerial powers. Four years later, the Sierra Leone People’s Party won the first parliamentary election. Following an independence conference held in April 1960, Sierra Leone was granted independence from the UK effective April 27, 1961. 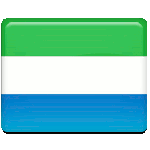 Sierra Leone Independence Day is a national holiday and an official non-working day. It is usually marked with speeches by government officials, concerts, marches, parades, banquets, and other events and activities that aim to highlight the history and culture of Sierra Leone. An annual Independence Ball has been held on the occasion since 2009. However, this isn’t always the case. In 2018, for example, the newly elected government announced there would be no celebrations in order to save money. Sierra Leone indeed is one of the least developed countries with high unemployment rates and an impressive international debt, so it was decided that independence celebration activities will only be funded when the country overcomes its economic and financial crisis.